A wristwatch-based translation device, designed to help British soldiers overcome language barriers, could be in production by the end of the year. The voice recognition-based technology would aid troops and civilians in high-risk situations. It translates phrases such as "don't shoot", "stay back" and "help will be here soon". 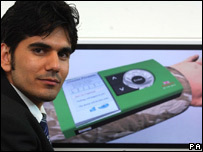 The technology is the idea of Derby-based Amin Ismail, an Iraqi-born former student who fled to the UK. The idea was first shown at the University of Derby's Arts, Design and Technology Degree Show earlier this year. Since the show Mr Ismail has landed a job with military equipment producer Civil Defence Supply (CDS) which hopes to get the device - known as the Ahky, Arabic for "speak" - into production within the next six months. Mr Ismail is originally from Baghdad but fled Iraq in 2002. He said: "One reason I wanted to undertake this project was because it was my way of thanking British soldiers for their honourable work, people who are abandoning themselves from their loved ones to bring freedom to Iraqi people. "Secondly, it is to improve the communication between soldiers and Iraqi people in high-risk situations where any misunderstandings might lead to a tragedy. "If this device can help save innocent lives in a conflict situation then that has to be good." Mr Ismail said the device could also incorporate languages other than the Arabic-English translations currently proposed. CDS managing director Eran Bauer said Mr Ismail would be a valuable addition to the company: "We have been so impressed with him. "This device will be a success in so many applications, not just for battle situations, but for the police, in immigration, charity projects abroad, terrorist monitoring, the courts, and in hospitals - to name just a few."